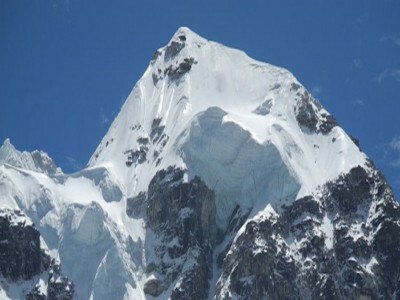 Kwangde peak climbing 6011m is a popular trekking peak in Khumbu Valley region. It is also known as Kwangde Ri and Kongde Ri. Its position dominates the Southwest area of Namche village the gateway to Everest. 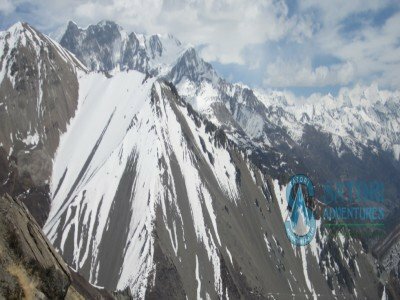 Kwangde peak is stands above the Bhote Koshi River a famous river in this region. The northern part of the mountain forms an impressive barrier having several steep ridges to the North. 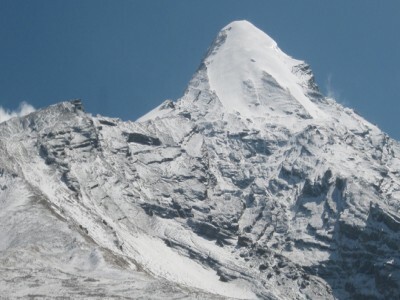 Kwangde peak is a technical and challenging trekking peak in the Everest region. 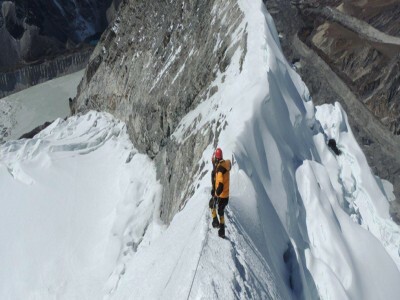 It can be scaled via its South or North faces, with the North side offering very technical routes and the South face being largely unexplored and challenging as well. 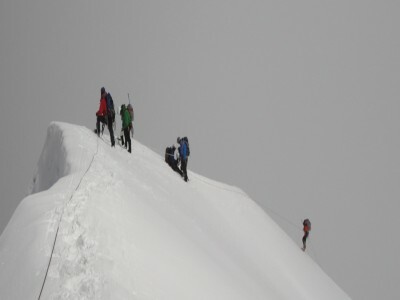 The summit panorama extends across the Khumbu, from Ama Dablam and Makalu in the East, to Everest and Cho Oyu and includes the spectacular Rolwaling peaks, to the northwest. 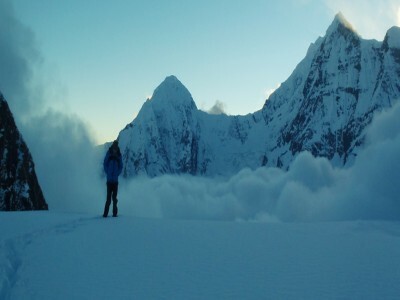 Since Kwangde peak has been open for climbing, numerous mountaineers successfully climbed this peak. The caravan route to Kongde Peak starts after you take a flight from Kathmandu to Lukla airport. You then start trekking toward Phakding. 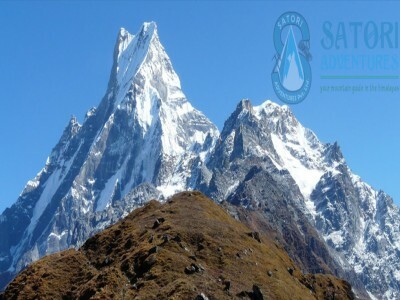 This trekking trail takes you all the way through the Khumbu Region passing through beautiful rhododendron forests, famous monasteries, yak pasture lands, beautiful mountains, and rugged topography towards the Namche Bazaar. Kongde Peak is situated just above this famous Sherpa village Namche which is known as the gateway to the Khumbu region. The northern part of the Peak forms an impressive barrier having several steep ridges to the North. From Namche bazaar you start ascending up to Kongde base camp at an altitude of 4700m. 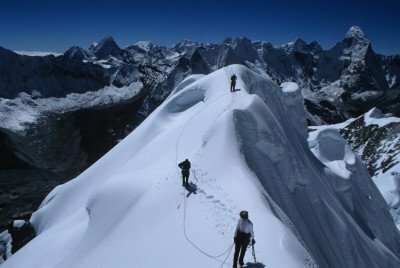 From the Kongde Peak base camp you climb up through some glaciers and steep rocky faces to approach the summit of the peak. 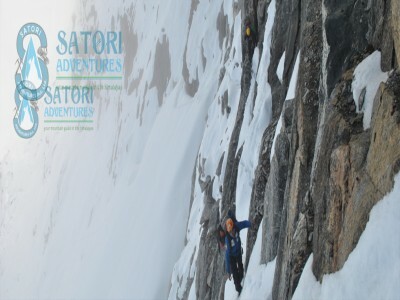 Satori Adventures main objective is to provide quality service from an experienced climbing staff. 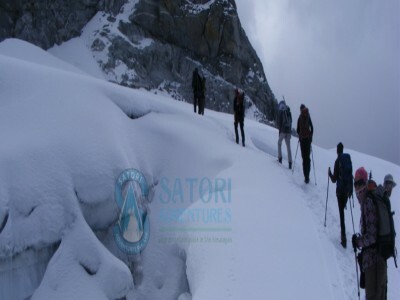 With Satori you will have maximum enjoyment and an unforgettable trip in the Dhaulagiri region. Our first priority is always safety, we make all of our decisions around this priority. 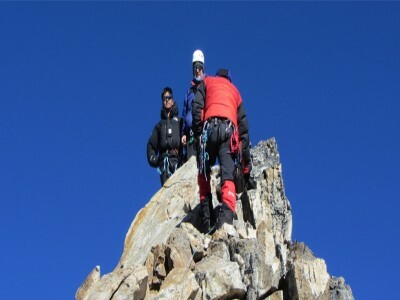 With our background in climbing and mountaineering logistics services we understand the requirements of independent climbers and employ climbing guides and base camp managers who are either Everest Summiteers or are certified by the Nepal Mountaineering Association. 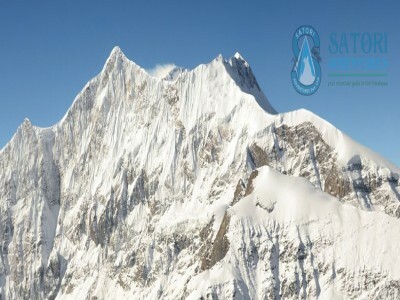 Our staff will always have certifications in mountain skills such as: First aid, altitude/mountain sickness prevention and search and rescue training. We pride ourselves with our previous achievements and high customer satisfaction. 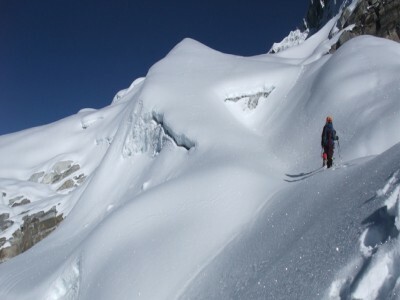 Our services are on par with the best climbing service providers in Nepal and we are always striving to be even better. 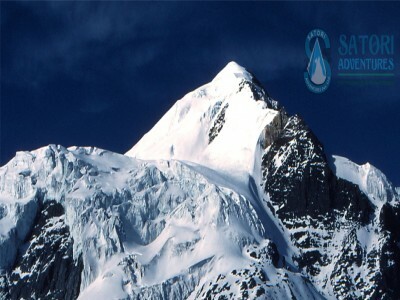 We have developed safe and smart systems in the mountains, working with many climbers and safety experts and from Europe and North America. 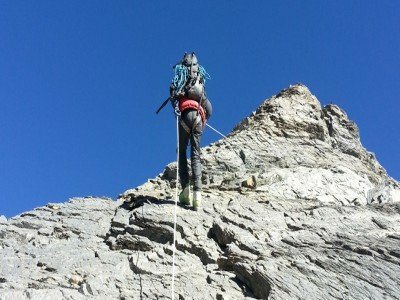 We request that climbers have previous experience in rock/ice climbing techniques and know how to use ice axe, crampons and ascend and descend on fixed lines. 12 Apr/Day 02: Preparation and briefings at the departments of tourism. Last minute shopping. 13 Apr/Day 03: Flight from Kathmandu to Lukla. Trek to Phakding (2650m/8,694ft); 4 hrs. Lodge accommodation. 14 Apr/Day 04: Trek from Phakding to Lumding La (4575m/15010ft.) 05 hrs, camping accommodation. 15 Apr/Day 05: Trek from Lumding La to Lumding Tso (5100m/16732ft,)-05hrs Camping accommodation. 16 Apr/Day 06: Rest/acclimatization day at Lumding Tso (5100m/16732ft. ); camping accommodation. 17 Apr/Day 07: trek from Lumding tso to Base camp (5100m/16732ft); 04hrs, camping accommodation. 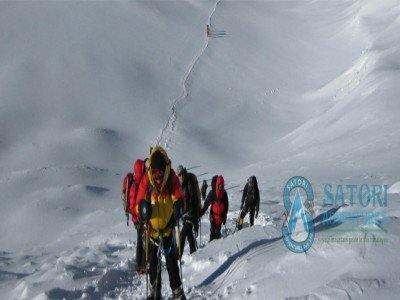 18 Apr/Day 08: trek from base camp to high camp (5400m/17716ft. )-05hrs climbing. 20 Apr/Day 10: Summit day Kwangde (6011m/19721ft.) and return to base camp. 21 Apr/Day 11: Trek from Base camp to Lumding Tso(5100m/16732); -06hrs camping accommodation. 22 Apr/Day12: Trek from Lumding to Phakding (2650m/8,694ft); 4 hrs. Lodge accommodation. 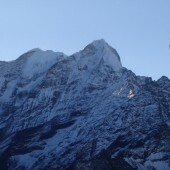 23 Apr/Day 13: Trek from Phakding to Lukla(2840m/9,317ft) 7hrs.Lodge accommodation. 24 Apr/Day 14: Fly 35mins from Lukla to Kathmandu (1350M/4,430ft) 35mins. Transfer to hotel. 25 Apr/Day 15: Leisure dayshopping in Kathmandu. Fair well celebration dinner with culture program in the Evening. 26 Apr/Day 16: Transfer to the airport for final departure. 05 Oct/Day 05: Rest day for acclimatization.You will be hike to the famous Everest View Hotel (3800m/12487ft) 3hrs and catch a glimpse of Everest. After you can explore Hilary and Sherpa museum in Namche.In the evening they have a slide show program as well. 08 Oct/Day 08: Rest/acclimatization day base camp. 16 Oct/Day 16: Leisure day shopping in Kathmandu. Fair well celebration dinner with culture program in the Evening. 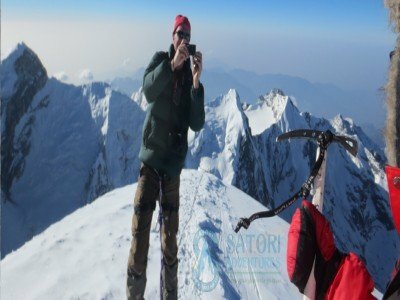 Assistance at the international airport by a Satori Adventure representative during your arrival and departure flights in Kathmandu. 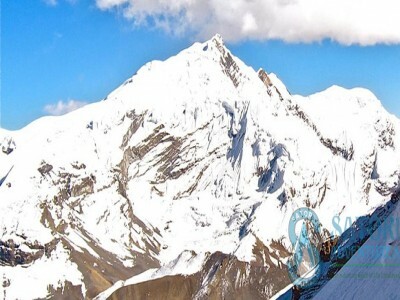 Flight tickets from Kathmandu-Lukla-Kathmandu to all the climbing members & Sherpa guide. 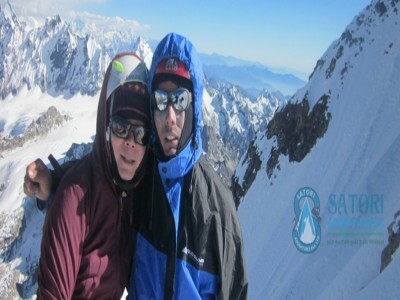 All trekking and mountaineering equipment available at advanced base camp. 20kg baggage allowance per person during the trekking period to base camp. Loads will be carried by porters. 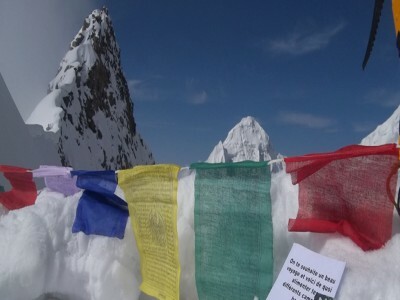 Expedition royalty and climbing permit of Nepal government to climb Kongde re peak (6011M/19,721ft). Equipment allowances and wages for, chefs &kitchen assistants. Assistance service for cargo clearance and duties. Trekking and climbing map of Kongde re peak. Please kindly submitTrip Booking Formwhen you confirm the trip with us. It will be easy for us to process for your trip conformation and prepare all legal processes and permit for the trip. If you have any query, always feel free to contact us at any time. We always want to make sure our clients are well informed before conforming the trip. You are always advised to visit our website and related package for further information. Panoramic view from Kongde re peak summit.